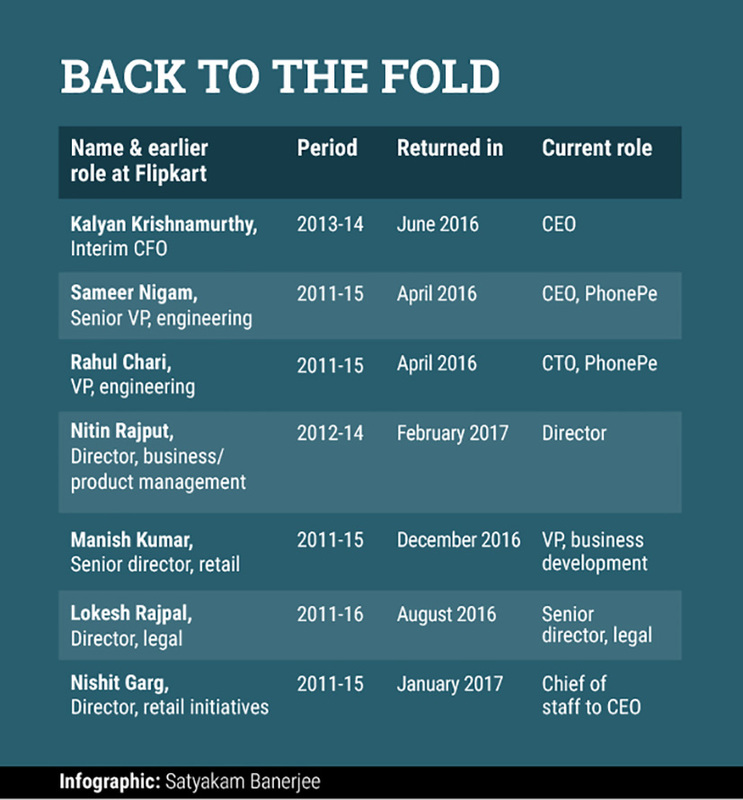 E-commerce major Flipkart, which has seen continuous churn at the top level for the last few quarters, is quietly working to revamp its senior leadership team by bringing back old hands. At least half-a-dozen senior executives have returned to the company in the last few months. Flipkart COO Nitin Seth, who also oversees the human resources (HR) function, told News Corp VCCircle that the company has rehired many senior employees as part of a well-thought-out plan. "It was a conscious strategy—we want to bring back the DNA," he said. Over the last one year, the company has had to change its CEO twice in the face of heightened competition from Amazon, successive markdowns by investors that slashed its valuation to almost a third of its $15.2-billion peak and a couple of failed funding talks. Not only have all non-founder CXOs quit the company, but several executives from the second layer, including senior vice presidents and vice presidents, have also left. Amid this churn, however, some of the old hands are returning. And this focus on rehiring former employees coincides with the return of former interim CFO Kalyan Krishnamurthy, who is leading efforts to put the company back on track. Among those who have come back over the past year are Lokesh Rajpal, who returned in August 2016, after a brief stint outside, to handle key functions at the legal department, and Nishit Garg, who had moved to Flipkart's main investor Tiger Global nearly two years ago. Garg, who has recently joined back, is Kalyan's chief of staff at Flipkart—the duo worked together at Tiger and, prior to that, at Flipkart. Similarly, Nitin Rajput, who joined Flipkart after it acquired his venture, Bollywood content company Chakpak, is back after working on his own startups for a little over two years. Earlier this month, Manish Kumar returned to the company as vice president, business development after a year-and-a-half. Sameer Nigam and Rahul Chari have the unique distinction of being acqui-hired by Flipkart twice. The duo had first joined Flipkart when the e-commerce major acquired their startup Mime360 in 2011. Nigam and Chari worked with Flipkart for four years before leaving in 2015 to build payment solution PhonePe. They returned to the Flipkart fold when it acquired PhonePe in April last year. Many of these men who are returning are seen as Kalyan's picks. But Seth dismissed suggestions that it is those who have worked with Kalyan are being brought back. "That is not necessarily the case. Most of these people were with the company before Kalyan first joined Flipkart," he said.